On May 27, Congressman Anthony Weiner’s lewd photo was leaked on Twitter. He claimed his account was hacked, but could neither confirm nor deny whether the photo was of himself. Later he apologized and admitted the photo was of himself. The controversy became known as Weinergate. This controversy has led other members of congress to be cautious about what they are posting on their Twitter accounts. According to congress tweet aggregator, TweetCongress.org, tweets from members of congress have gone down approximately 30 percent since Weinergate. To find this number, TweetCongress looked at tweets from May 9 to June 8, excluding weekends (we’re not sure why). 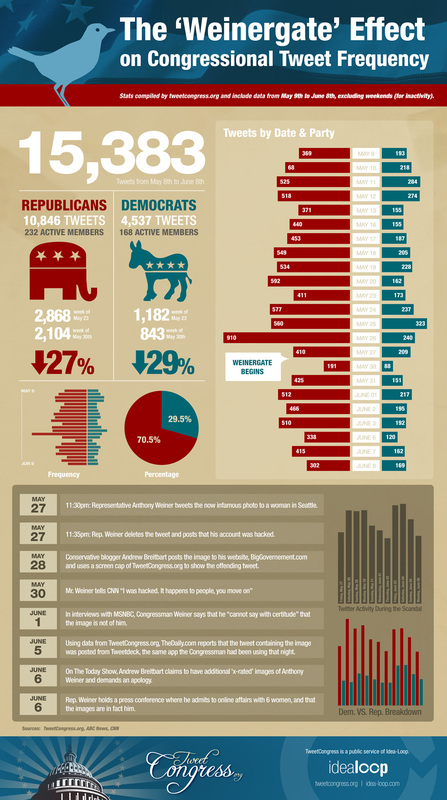 They have compiled this data into an infographic which shows the usage of Twitter by active congressmen and women following the Weiner scandal.